There are three places in this world I desperately want to go: Scotland, Ireland, and England. They are on my bucket list big time. Until I can actually make it to these places, I immerse myself in reading, food from the area, local photography and anything else I can get my grubby little hands on. 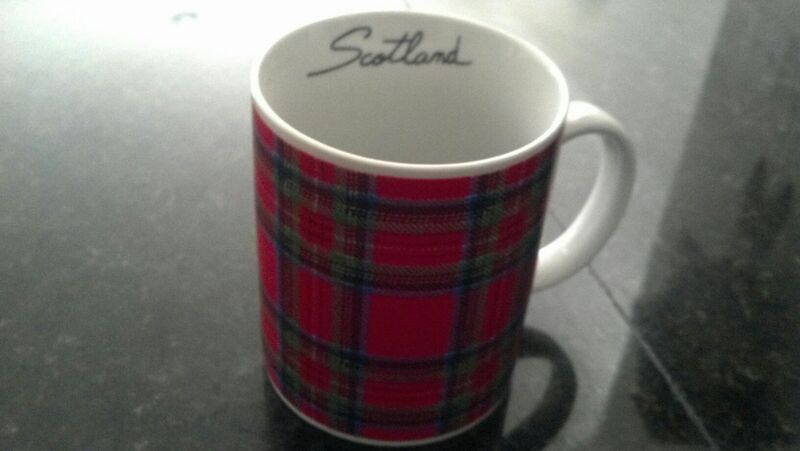 I was thrilled to recently find a web store that sells authentic Scottish items, as in, there’s a brick and mortar store in Scotland with items made in Scotland. And for me it’s a thrill to receive something that’s actually from the country. Oh sure, there are many such stores. But none I can usually afford. Until…Heritage of Scotland reared its lovely Scottish head. I feel the need to rave a bit about this place. They have a “deal of the day” and routine clearance items which are ridiculously inexpensive. I ordered two coffee mugs that were clearance items in fact. 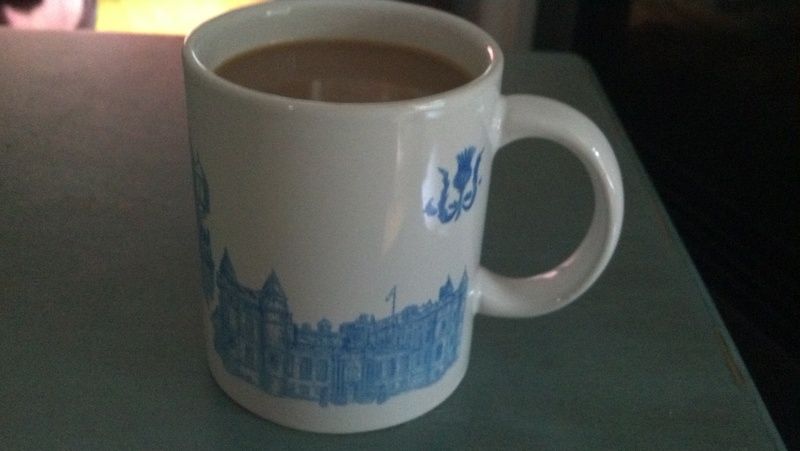 I collect coffee mugs in case you’re interested (oh come on, I know you are!). 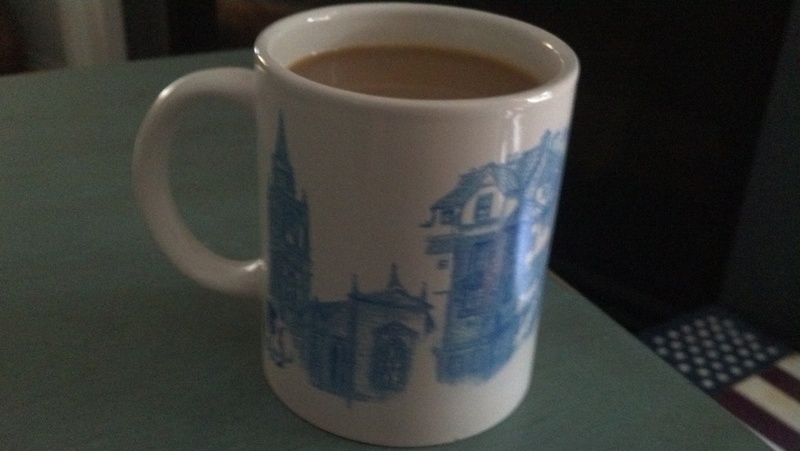 It was very cool to be able to get touristy mugs without actually having to wait until I could afford the plane tickets for the trip. I like them both (obviously…I mean why would I buy something I didn’t like?) but my favorite is the one with scenes from around Edinburgh, Scotland’s capital. It’s beautiful, I love it. 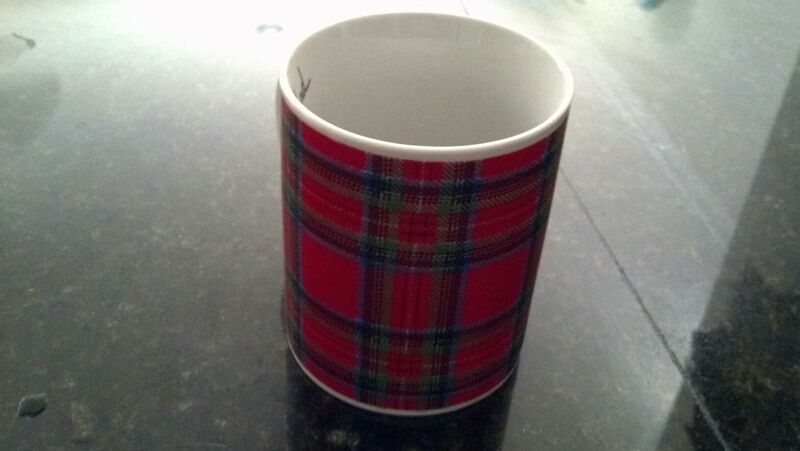 The second mug is a tartan design and I bought it specifically for hot chocolate come winter time. I don’t know, it just screamed winter to me. What? Mugs don’t scream at you? I’m sorry. The other items I ordered I’m hesitant to describe because they’re Christmas presents for someone who is known to read this blog (Hi Mom! *waves*). Although Christmas is still very far away and there is still plenty of time for those things to wind up in my closet rather than a prettily decorated box under a tree. Just saying. There’s a fairly even chance actually. Maybe 60/40 in my favor. Could be 70/30. Oh hell. I should just hide them from myself now. Heritage of Scotland doesn’t sell just touristy stuff. You can buy men’s kilt sets there (who doesn’t love kilts – especially when they’re covering the hips of such handsome Scots as Jamie Fraser – from that fantastic new TV series Outlander, for example!!! ), as well as clothing for women and children (some even made to order), jewelry, toys and costume stuff for kids, and even musical instruments – like bagpipes! How cool would it be to buy a set of bagpipes!? And, of course Scottish food. Including haggis, which I am not ashamed to admit I would not order. That’s one bit of Scottish culture I’m not anxious to try. But I am going to order some of the sweets next time as well as some of the heather tea. Because those looked yummy. I know, I know, I sound like a kid with a new toy. I can’t help it. But one thing I do want to mention before you guys get tired of hearing me gush – during the order process I had a dim moment which prompted me to contact customer service with a somewhat inane question (okay, okay, a really stupid question). I have to hand it to Heritage of Scotland’s customer service department though; they treated me with the utmost respect and were very polite. But more than that, they were downright friendly…definitely not something you see much of anymore these days. It was like a breath of fresh air. They could have just as easily called me an idiot…and they would not have been wrong. Cool products aside, that interaction is what sealed the deal in making me a returning a customer. So. That’s my positive rant for the day. As you guys know, I don’t do reviews as a general rule. It’s not that kind of blog and I’m usually too hard to please anyway for anyone to warrant a positive review. However, I really felt the need to make an exception in this case. I hope you’ll check out Heritage of Scotland. It’ll be well worth your time, I promise. Below are the mugs I mentioned. I wish I could show you the other things, they are gorgeous. And I’m truly hoping they last untouched until Christmas so they’ll make my mother smile when she opens them. No promises though Mom. This entry was posted in Everyday Musings and tagged Heritage of Scotland, humor, observations, reviews, Scotland, scots, shopping. Bookmark the permalink. I would definitely love to read the poem!! I want to go there so badly! Every time I have any money saved at all, something happens to eat it up. But I’m determined to get there at some point in time even if I’m old and grey. I’m in Europe, it’s easy for me to go to Scotland. That’s definitely a good decision if I may say so. I hope you’ll visit this wonderful, soon to be independent, country! I actually thought when I first read a few of your posts you were Irish! I will take that very much as a compliment! I have Irish ancestry. My great-grandmother is Irish (I’ve talked about her before, Grandma Mooney). I’ve always had a great affinity for that country even when I was a young child and that may be why. 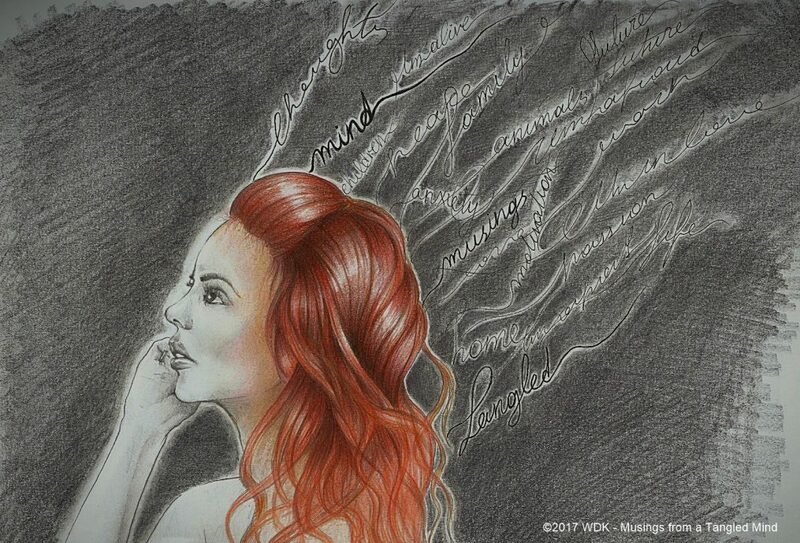 I wrote an entry a while back on it (2/27/14). I know, right!? I have so many they fill two kitchen cabinets. But I can never have enough. I love getting new ones! I’ve been to England but, like you, still have Scotland on my wish list… There’s a shop in Maine that makes kilts and has many items like those in the online store – or at least there used to be. I got a kilt made for me in Maine and enjoyed it for many years. Thanks for the heads up for a place now to order a one for this coming winter. You’re welcome! Please come back let me know what you think of the place if you decide to order a kilt from them. Did you enjoy England when you went?